While a wooden garage door looks great for just about any home, there are times where it can develop problems that will require repair. However, if you’re alert to those signs, you can have a professional check your door before those issues become serious – and more expensive to fix. Here are some indications that you should call an expert. It’s very important that you have a professional take a look at your wooden garage door so that it’s not at risk of failing when you need it the most. If you’ve had your door for a long time, there’s a chance that it may begin to get out of balance. Springs can wear down to the point where one side of the door is in worse shape than the other. It may become slightly annoying at first but could quickly lead to a big problem. The reason this happens is that the springs can withstand only so much stress until they start to break down. 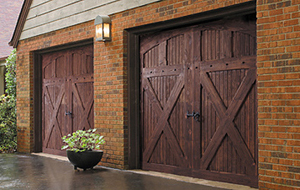 A wooden garage door can wear down due to the elements. As a result, gaps or spaces may develop. If you ever see any sort of crack or hole, then there’s a high likelihood that there is more damage that you can’t see. Even the best-made door can be damaged due to mold and moisture. If this happens to you and the issue is caught in time, you may be fine with a relatively minor repair. However, if you neglect the problem, you may be looking at a complete repair. Let a professional with Action Garage Door check your wooden garage door and see if there are any issues that need to be addressed. Give us a call at 817-204-0917 or contact us online to schedule an appointment.